SUPERCAT is a purpose built dive platform. Featuring a huge air conditioned saloon with comfortable lounges and tables. SUPERCAT will take you to the coral reefs and wrecks of Brisbane's Marine Park in comfort. She has onboard compressors, 2 large duckboards and dive ladders and a large back deck. A buffet lunch of chicken, leg ham, cheese, salads and fresh bread rolls as well as morning tea – fruit cake. We also sell soft drinks, chips, chocolates, etc from her fully featured galley throughout the day. Coffee and tea are provided FREE all day. SUPERCAT is licensed and you can purchase alcohol after diving and relax on the way home in the lounges watching our 2 large TV screens. Nemo or Shark Tale movies anyone?? Please note that there are NO Eftpos or Credit Card facilities on board, please bring Cash for any other purchases. * Private tanks must in test for us to fill them onboard. No DIN tanks or DIN adaptors are available onboard for hire. All divers are required to provide: A certification card, dive knife and a safety sausage (SMB). Certification cards MUST be presented on the vessel to scuba dive or participants will only be allowed to snorkel. Internet access is not available for Diver Verification prior to departure on the morning of the trip and not all agencies can be accessed. Refunds will not be available for divers without a dive licence. No Certification Card = no scuba diving, but you are welcome to snorkel! Dive computers MUST be used on all dives on SUPERCAT. Computer hire is available onboard. All patrons must sign the required waivers to participate. No refunds will be given if any passenger who refuses to complete our mandatory paperwork. Our Dolphin Wild Eco Cruises are more suitable for snorkelers. 1 to 2 snorkel dives will be available on the day. 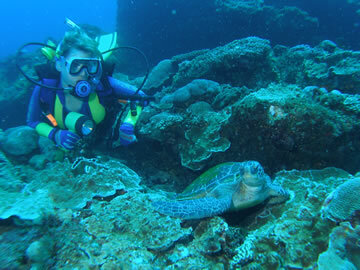 Length of snorkelling will also depend on weather/conditions/dive schedule. The days are planned around the divers. Please note snorkelers MUST be able to swim and snorkel and be over 12 years of age. No baby sitting facilities are available onboard. Can be made using a credit card by phone (07 3880 4444) or our Trip Booking Form. Please note credit cards incur a 2% transaction fee. We MUST receive payment in full to confirm your place before the trip. By booking you are accepting our trip conditions. Always check with Supercat Charters by 3:00pm on the working day prior to your departure to confirm the schedule. Prices, trips, vessel and destinations are subject to change without notice due to weather, availability, etc. No refunds of any kind will be given for any unused portion of a trip. This includes dives and/or hire equipment. If any dive is missed it is gone! For further information, please contact our staff. If we cancel you may receive a refund or transfer to another day. Please note our Cancellation Policy which applies to all trips. 1 air fill for 2nd dive. All day FREE tea & coffee. See Dolphin Wild Eco Cruises. Loading at the vessel is at 6:45am SHARP. Return time is approximately 3:00-3:30pm. SUPERCAT vessel is berthed in Row C at Newport Marina 158 Griffith Road, Newport (not Scarborough Boat Harbour). © 2019 Supercat Charters, Brisbane, Australia. All rights reserved.